Acosta Confirmed As Labor Secretary, First Latino Member Of Trump Cabinet : The Two-Way In a bipartisan vote of 60-38, the Senate confirmed President Trump's second choice for labor secretary. Trump's first nominee, Andrew Puzder, withdrew when it became clear he would not be confirmed. 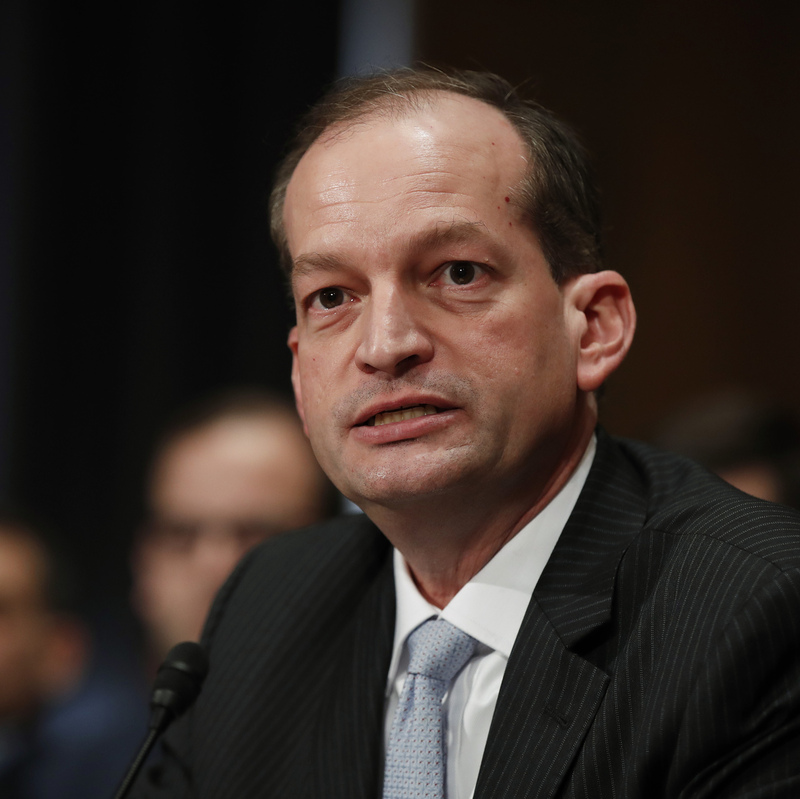 Alexander Acosta testifies last month at his confirmation hearing before the Senate Health, Education, Labor and Pensions Committee. The Senate confirmed Acosta as labor secretary on Thursday. Alexander Acosta, 48, will be the Cabinet's first Latino member. Acosta is dean of the Florida International University College of Law in Miami. Acosta was assistant attorney general in the U.S. Justice Department's Civil Rights Division under President George W. Bush, who later appointed him U.S. attorney for the Southern District of Florida. Acosta is Trump's second choice for labor secretary. His first nominee, fast-food CEO Andrew Puzder, withdrew when it became clear he lacked sufficient support in the Senate for confirmation. Puzder was criticized for hiring a household employee not authorized to work in the United States, and other issues related to his personal life. "Sen. Tim Scott, R-S.C., spoke for many Republicans with a statement issued just after the vote saying he hopes Acosta's focus will be 'promoting labor policies that are free of unnecessarily burdensome federal regulations.' Scott said he wants Acosta to permanently revoke rules governing financial advisers and adding Americans eligible for overtime pay. "Democrats and most labor groups were mostly muted in their response to Acosta's nomination. At his confirmation hearing, Democratic Sens. Patty Murray of Washington and [Elizabeth] Warren [of Massachusetts] hammered Acosta for answers on a selection of issues important to labor and whether Acosta would cave to political pressure from Trump. Acosta refused to answer the policy questions until he's confirmed, and he vowed to be an independent and fair voice for workers. Both senators said they had great concerns, and both voted no."